Tatiana Santo Domingo, her husband Andrea Casiraghi and their children Sacha and India Casiraghi attended celebrations of Monaco National Day 2016 at Monaco Principality Palace. 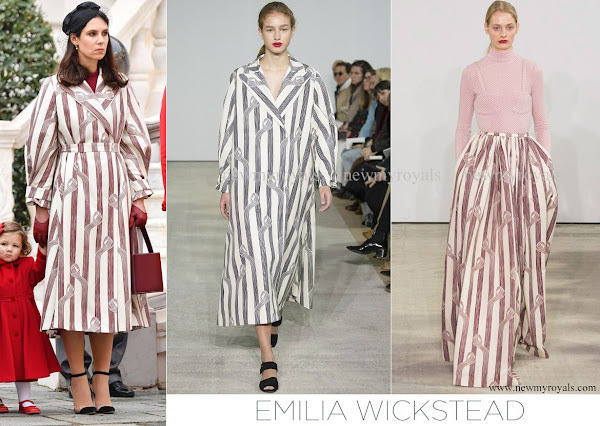 Tatiana Santo Domingo wore an Emilia Wickstead Floral A-line Printed coat for Monaco National Day celebrations. The coat is from Fall 2016 Ready to Wear season. The black sandal worn by Tatiana is Gianvito Rossi branded. That movie btw is wonderful but bring Kleenex. I just said as much to my husband. Looks like concentration camp clothing to me. she is always dressed special, like a gipsy. One of the worst coats ever. I don't like many of her outfits nevertheless I have to say her outfits and accessories are always coordinated well together in the same style. I like the fact that she dares to be different. She's very pretty and needs to find another stylist. What is wrong with this woman's style? This is stunningly ugly. Emilia Wickstead really struck out when she designed and produced this striped coat. Very unflattering. Even a stylish woman like Tatiana cannot successfully carry it off. It looks terrible on her and also on the model. The coat looks like a dressing gown/robe, not something one would wear out of the house.